While doing research on social media usage, I came across the image on the right. 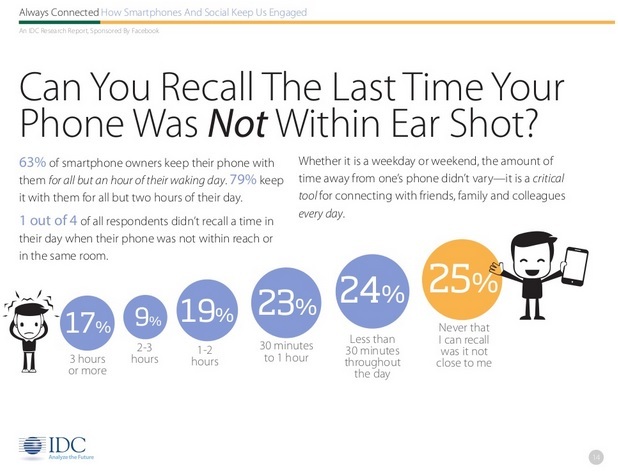 It’s from a fascinating study on smartphone usage which you can read in full here. Since we’re already practically attached at the hip to our phones here are some tips for incorporating them into your prayer life. Catholic Apps – a pretty basic starting point. There are apps for praying the rosary, breviaries, and more. Here’s a good recap of some of the best ones and reviews. Schedule prayer time – one great thing about smartphones is how they help us stay on top of things. I have reminders for grocery lists, emails, events, you name it. Try adding a daily prayer reminder in your day. Not just at night, but in the middle of the day. It doesn’t have to be a long prayer, but when you see that notification pop-up, take a moment to stop and pray. Some days you might have more time to devote to prayer, others it might be a rushed thank-you, but reminding yourself to stop and be thankful at least once a day will have a great positive impact. Start the day with prayer – Another statistic from the study that stood out to me is that within the first 15 minutes of their day, 4 out of 5 smartphone users are reaching for their phones – 44% (myself included) use it as their alarm clock. What exactly are we checking when we pick up our phones? Email, Facebook, Texts, Twitter, etc. are likely candidates. Similar to the previous tip, instead of idly looking through Facebook, use this morning time on your phone for prayer. Find what works for you: a daily Angelus, using a breviary app, reading the day’s Mass readings, or your favorite prayer. Read the Bible – I really enjoy the Bible app YouVersion. It allows you to create customized reading plans or choose from one of their preexisting ones and reminds you each day to read the Bible. You can also bookmark, take notes, and highlight the readings. Keep track of what in the readings has an impact on you or maybe raises questions for you and go back later and read over them again. Turn it off – Or at least put it in airplane mode. While all the above tips are useful ways to involve your smartphone in your spiritual growth, sometimes the best thing for prayer is to unplug and reflect in silence. As the study suggests, this is hard for many of us to do in our lives. It doesn’t need to be an extended period of time – I know I’m in the 25% of people who can’t recall the last time my smartphone wasn’t near me – but turning off your phone allows you to focus in a way that is impossible when you might be wondering what new notifications are popping up.